Dimensions: height 32cm, diameter 27cm, weight 1,7kg. Available colors: Glossy white, Transparent, Black transparent, Amber transparent, Red transparent, Pink transparent, Violet transparent, Blue transparent. 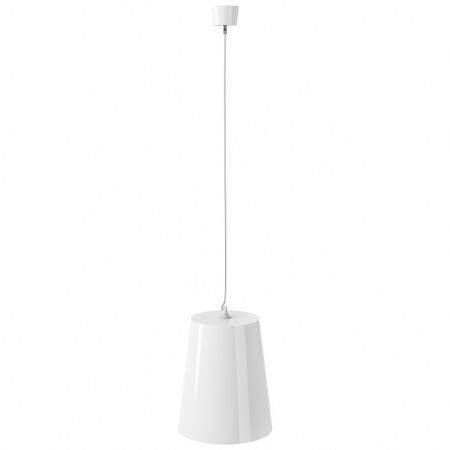 NOVA is a elegant suspension lamp composed of polycarbonate structure extremely durable. Thanks to its many color variations, offers the possibility to find the right shade in the furnishing of any living area, from the kitchen to the living room, with elegance and uniqueness. NOVA suspension lamp is provided of 25W energy saving lamp (with the possibility of supporting even higher lighting powers). It should be noted that, to facilitate assembly and disassembly, the diffuser can be removed without disassembling the electric body. We remember that, with the same features is also available the DODO suspension lamp (see below in the related products). Siesta Exclusive utilizes only plastics materials of great reliability and quality. In all the articles compounds from polycarbonate, is used Makrolon® produced by Covestro: thermoplastic material high-performance, provided with excellent balance, and excellent properties of resistance. A polycarbonate among the most versatile and successful of always.